Goshen College is renovating the union building, 70 years after the building’s original model. Although parts of the union building have undergone revisions, there have been parts of it that remained untouched. Glenn Gilbert, the project manager of the union renovation, said, “The West quarter and the snack shop, or Leaf Raker, haven’t been renovated.” When the Leaf Raker underwent a small revision process 35 years ago, Gilbert said, “They didn’t change the windows…they didn’t change the heating system.” “It hasn’t been air conditioned since the day it (Leaf Raker) was built,” Gilbert said. The new modifications being made in the Leaf Raker appeal to not only Goshen College students, but also those who live in the Goshen community. Another new addition to the union building will be an art gallery, named the Hunsberger Haitian Art Collection after an abundance of Haitian art was donated to the campus. 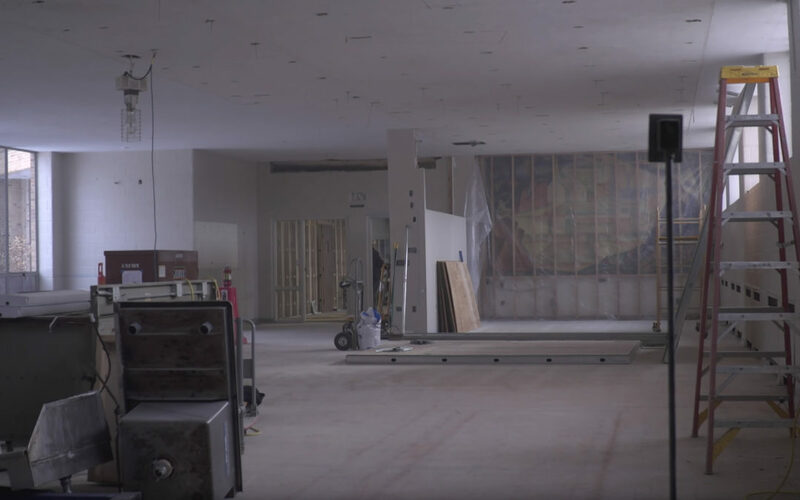 Corson predicts that the union renovation will peak the community’s interests through this “new art exhibit and admissions entrance,” as well as “food service. The renovation is expected to be completed by the beginning of Goshen College’s fall semester in 2019.